Dental surgeons can make mistakes in surgery, particularly after a long hard day, however, when drilling into a patients gum for a dental implant, it is crucial that this task is carried out precisely and accurately. 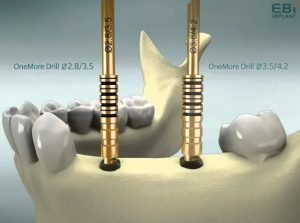 The OneMore Drill, by Evidence Based Implantology (EBI), has an extremely accurate scale to provide a guide for dentists to go to precision depths each time. This affordable, simple and easy to use drill can make all the difference to dental surgeons and provide them with the means to be more consistent and fit implants better. This, in turn provides greater satisfaction and oral hygiene quality of life.